As I sit here typing this, I can feel the air changing. It’s that time of year where it’s still warm enough outside to feel like summer but the feel of the air and the shine of the sun are telling us fall. I know everyone (including myself) goes crazy for Fall and I’ve been thinking about that more and more. Surely it extends beyond Pumpkin-Spice everything right? For me it signifies a welcome change and a cozy time for my family and I. It’s change from the free-for-all of summer and back to productivity which I find I thrive on. It’s also the anticipation of Halloween, Thanksgiving and football and other family favorite activities. And the cozy smells coming out of the kitchen? It makes me happy and thankful to be home. I’m not sure, but there’s something about the way the sunshine pours into my windows that makes me feel at peace. So yes, autumn is so much more than just pumpkin spice to me. Did I mention the kids are back at school?! But yes, pumpkin spice is also everythaaaaang. 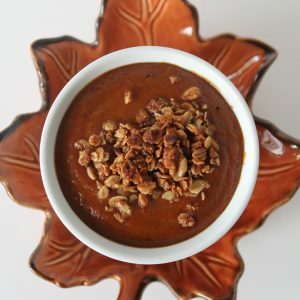 When creating this recipe I realized that it encompasses so much about fall that I love. 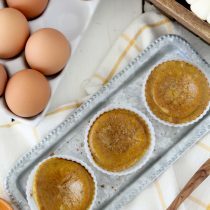 It’s the perfect make-ahead breakfast for those busy back-to-school mornings now that we’re back on a schedule. You can make this ahead of time and it reheats perfectly, it will last for a few days in the fridge, although my family tends to mow through it in two sittings. I love being able to wake up and give the girls something quick and healthy to start the day off without having to spend a lot of time doing so. It also checks off the “cozy” and “makes your house smell amazing” categories. (No candle can replicate those smells!) Last but not least, it has me covered in the pumpkin spice zone. Oh boy, does it have me covered. I first started using North Coast products about two years ago when I spotted them at Whole Foods. I started with their cider as I loved that there were no additives and it actually tasted like fresh apples. When I first tasted their cider I realized THIS is what apple ciders and juices are supposed to taste like. REAL apples. My husband and I started creating cocktails with it and I started buying it for my children. As time went one, I found myself using their products more and more in my cooking. In fact, it is the ONLY apple juice / cider / sauce I use now. I love that all of their product are 100% organic and GMO free. Beyond that their company has a rich history and is located near me, I love that! I encourage you to check out some their product online here. They even have different varietals of apple juices including a Honey Crisp Apple Juice! We may have even done some taste testing of the different varieties with the kiddos. Fast forward to when I met the North Coast team at Expo West this year. I introduced myself and raved about how much I love their products. Clearly, I’d become an apple groupie somewhere along the way. Over the next few months I learned more about new products on the horizon from them and was able to try a few. Clearly, I fell in apple-love even more! And then I opened the Pumpkin Spice Apple Juice and Pumpkin Spice Apple Sauce and immediately began thinking of recipes I could make with them. 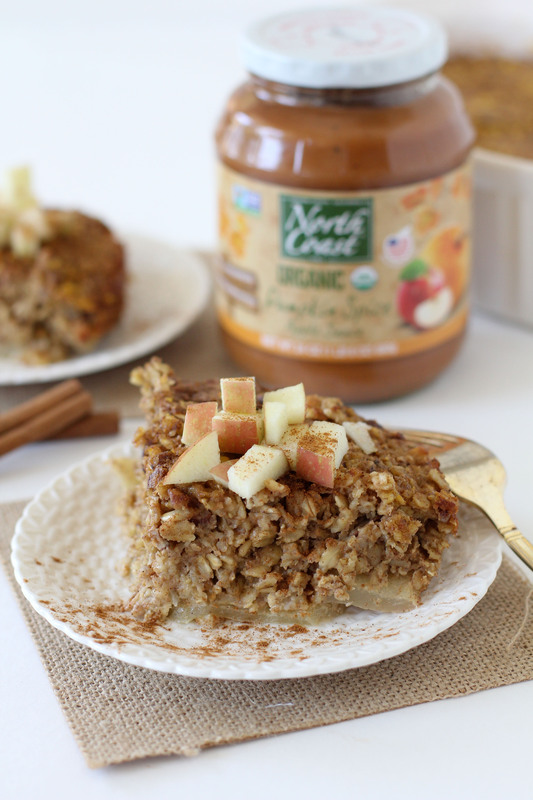 This oatmeal bake was one of the first things to pop into my head. While I limit the grains I consume, I do consume gluten-free grains from time to time and give them to my kids. Paleo isn’t a one size fit all and I find I feel better when I’m consuming enough carbs and that includes a variety of gluten-free grains. I think it’s important for people to see what makes their bodies feel good and go with that. If you don’t avoid gluten you can use regular oats as well. This oatmeal bake is so easy to make and incredibly delicious. It’s the perfect way to start a brisk fall morning. Not to mention the entire thing is sweetened with only 1/4 C. of maple syrup and 1 tsp. of coconut sugar. 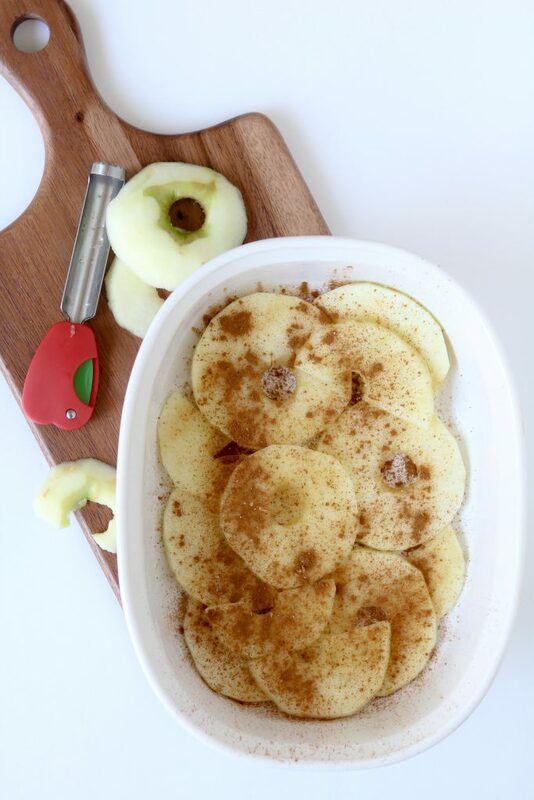 I also layer some sliced apples along the bottom to bring a bit more texture and tartness to the dish. 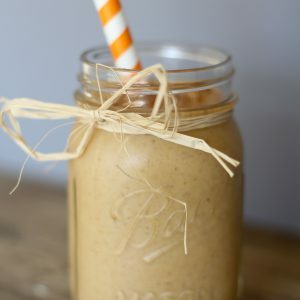 I used North Coast’s Pumpkin Spice Apple Sauce in this recipe but as a head’s up it is not yet widely distributed. 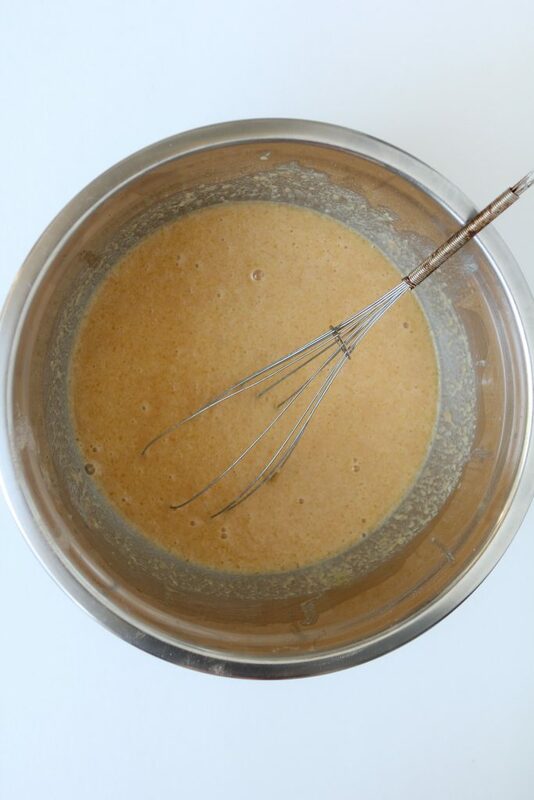 If you are unable to locate it at a nearby grocer, you can use 1/2 cup of regular apple sauce and 1/2 cup of pumpkin puree in it’s place. 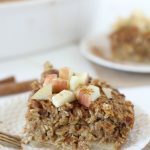 I’m certain that you will enjoy this cozy breakfast recipe and all of North Coast’s products as much as my family does! 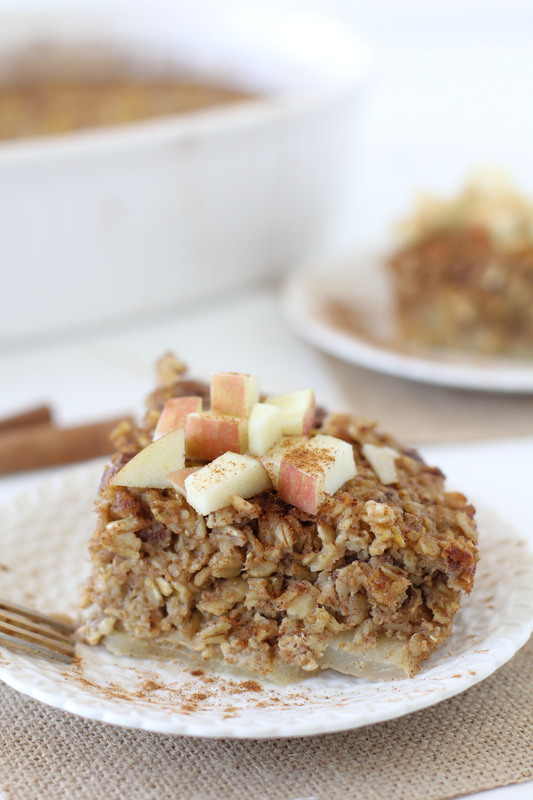 Pumpkin + Apple Oatmeal Bake from the Whole Smiths. 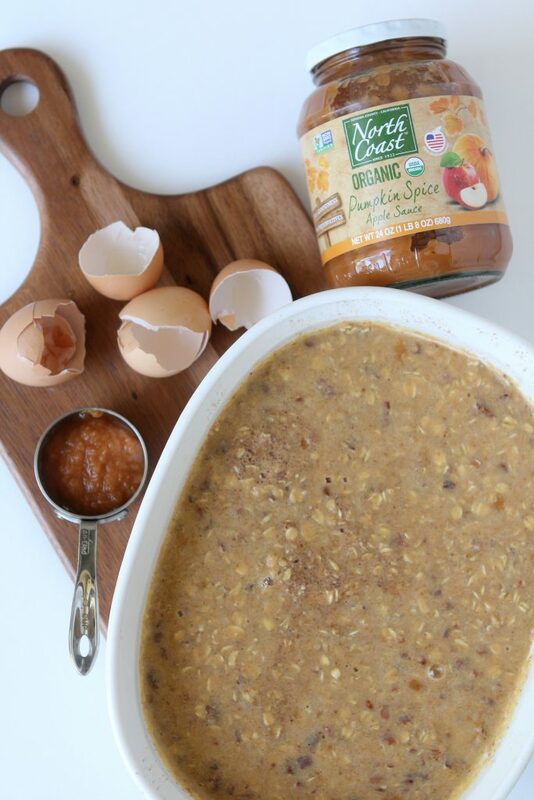 An easy to make breakfast perfect for fall mornings. I don’t know what I did wrong. I added 4 eggs instead of 5, and the top of the casserole looked like and tasted like scrambled eggs. Now I can’t wait for breakfast tomorrow. This recipe has me drooling!!!! This sounds amazing, unfortunelty I have an egg allergy on top of lactose issues. How would you recommend making this without the eggs? Unfortunately I have not recipe tested it otherwise. When do you use the pecans? Michelle This sounds AMAZING! Do you have any thoughts on making this in a muffin tin. These would be great for lunchboxes or on the go…. I wonder if you could divide the dry ingredients in individual muffin cups and pour the mixture in to cover than bake. Any thoughts…. I may try this. If not baking the full dish and then putting in a little wrapper i suppose would work too. I love your recipes! And your book!!! FYI when to add the pecans into the recipe isn’t mentioned. Also I made this and it turned out looking weirdly like ground beef. Could you portion out and freeze? note: your recipe above doesn’t specify when to add pecans. The recipe was amazing! It was a big hit in my house and the house totally smelled of fall! I cooked it in a square baking dish and it needed an additional 10 minutes. Do you recommend a different size dish?